The Communist Party USA (CPUSA) and their allies in the Democratic Socialists of America (DSA) have backed Barack Obama for many years. So what you say? How can a couple of fringe Marxist sects with a combined membership of probably under 10,000, possibly effect a country as powerful as the United States of America? In this report from the Communist Party USA's Political Affairs website, humbly entitled "Special Interest or Class Consciousness? How Labor Put Obama in the White House" the communists explain how socialist led unionists elected a president. Political Affairs explains the importance union backing played in the Obama campaign and goes on to quote AFL-CIO President and well known DSA member John Sweeney and AFL-CIO Political Committee Chair and AFSCME President Gerald McEntee-also allegedly a DSA member. 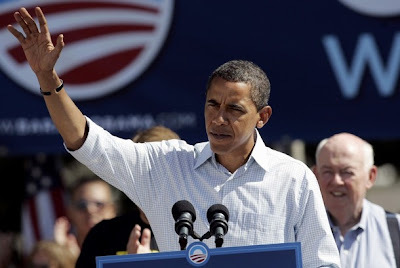 "New polling data released this week by the AFL-CIO revealed the extent of union support for Barack Obama in the presidential election. The data showed that a "high turnout among working-class union voters in states like Ohio, Pennsylvania and Michigan formed a foundation of support for Obama." In addition, union voters in key battleground states like Colorado, Virginia, North Carolina and Florida proved influential as well, an AFL-CIO press statement on the new data indicated. Union members supported Obama by a 68-30 margin and strongly influenced their family members, according to an election night survey conducted for the AFL-CIO by Peter D. Hart Research Associates. According to exit polling by major media outlets, voters from union households totaled one in five voters. “More than 250,000 union volunteers took to the streets in the largest independent voter mobilization in history,” AFL-CIO Political Committee Chair and AFSCME President Gerald McEntee said. Union education and mobilization efforts turned in impressive statistics for the Obama-Biden ticket, the data revealed. Obama won among white men who are union members by 18 points. Union gun-owners backed Obama by 12 points. Union veterans voted for Obama by a 25-point margin. In the general population, Obama lost these groups by significant margins. In addition, labor leaders stated that an immediate goal is to pass an economic stimulus package that provides direct relief for working families by strengthening the social safety net, creating jobs through public infrastructure investments, and directing financial relief to states to help cover costs of health care and education programs. The AFL-CIO mobilized 250,000 volunteers in 24 battleground states. In its final "get out the vote" push," the AFL-CIO boasted, union volunteers contacted 1 million union voters. Throughout the campaign, the union said, the labor movement made 76 million calls, knocked on 14 million doors, and circulated 29 million fliers at work sites and union households. The effort identified a total of 3 million "undecided" voters and helped convince many of them to support Barack Obama." That's step one. Use union muscle to get who you want elected, elected. Step two. Use front groups and unions to push socialist policy inside the Democratic Party. Make communist/socialist policies "respectable" by giving them a Democratic Party label. Step three. Use your sympathisers, allies and secret members inside the Democratic Party to get your socialist policies passed into law. In an adjacent article Political Affairs extensvely covers Dr Quentin Young's call for a "single payer" health care system. "Single payer", or socialised medicine is a long time platform issue for both CPUSA and DSA. "A group of over 15,000 U.S. physicians has called on President-elect Barack Obama and the new Congress to "do the right thing" and enact a single-payer national health insurance plan, a system of public health care financing frequently characterized as "an improved Medicare for all." "Our country is hailing the remarkable and historic victory of Barack Obama and the mandate for change the electorate has awarded him," said Dr. Quentin Young, national coordinator of Physicians for a National Health Program. "In large measure Sen. Obama's victory and the victories of his allies in the House and Senate were propelled by mounting public worries about health care," he said. "Yet the prescription offered during the campaign by the president-elect and most Democratic policy makers – a hybrid of private health insurance plans and government subsidies – will not resolve the problems of our dangerously dysfunctional system.," Young said. "The only effective cure for our health care woes is to establish a single, publicly financed system, one that removes the inefficient, wasteful, for-profit private health insurance industry from the picture," he said. "Single payer has a proven track record of success - Medicare being just one example – and is the only medically and fiscally responsible course of action to take." "A solid majority of physicians endorse such an approach," Young said. "An April 2008 study in the Annals of Internal Medicine shows 59 percent of U.S. physicians support national health insurance. Opinion polls show two-thirds of the public also supports such a remedy. Now, with strong political leadership, this reform is within reach." Young said the adoption of a single-payer health system can be a "major component of the new president's economic rescue of Main Street." Young noted that Obama has said more than once that he is a supporter of a single-payer universal health care program, and that if he were "starting from scratch," he would favor adopting one. In 2003, Young said, then Illinois state Sen. Obama remarked that "first we have to take back the White House, we have to take back the Senate, and we have to take back the House." Young remarked: "Tuesday's election has made all of these conditions happen. In his first 100 days, President Obama has a window of opportunity to inspire the nation by championing the enactment of single-payer national health insurance under the slogan, 'Everybody in, nobody out.' Such a plan is embodied in the U.S. National Health Insurance Act, H.R. 676, introduced by Rep. John Conyers Jr. (D-Mich.) and co-sponsored by more than 90 others, more than any other health reform legislation." "Adopting a nationwide single-payer system will build on the great achievement of Medicare, further unify our people, strengthen our country's economic competitiveness and assure President Obama's legacy as an American hero," Young said. The article doesn't say so, but Quentin Young is a leading member of Chicago DSA. Before joining DSA in the early 1980s Young was heavily involved in Communist Party fronts and in the early 1970s was accused by a Senate Internal Security body of once belonging to the North Chicago Bethune Club of the CPUSA. 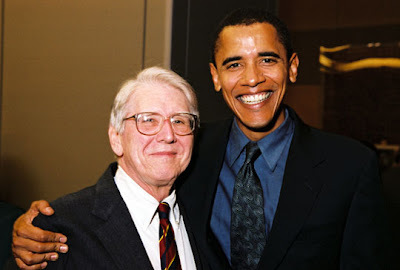 Quentin Young is a long time personal friend and political supporter of Barack Obama. he was present at the famous 1995 meeting in the home of former Weather Underground terrorists Bill Ayers and Bernardine Dohrn, that helped launch Obama's poltical career. Quentin Young has treated both the Obama and Ayers/Dohrn families. "Single payer" advocate Rep John Conyers also has a long communist front record, is reputedly a DSA member and is most certainly a strong Obama supporter. DSA and CPUSA controlled unions got Barack Obama (and dozens of other socialist Democrats)elected. DSA and CPUSA fronts use those beholden politicians to promote socialist policies inside the Democratic Party. By using front groups like Quentin Young's "Physicians for a National Health Program", the communists and socialists can advance their agenda under a false flag. Their sympathisers and allies in the Democratic Party can then promote and vote on those policies, claiming them as their own-leaving the public in the dark as to their true source. The socialist threat to America, comes not from abroad, but from the DSA/CPUSA controlled unions, their front groups and their allies in the Democratic Party. That is how a few thousand dedicated activists can influence and in some cases control, the political direction of the mightiest country on earth. How much easier will it be, now that their man has the top job? The question isn't what Obama will do (we know who he is) as much as what will we do to keep him in check? It's going to take a lot of pressure from people in the new media, but with a Pelosi/Reid congress, he pretty much has carte blanche. Hussein is the President elect. It is like a bad dream or a Twilight Zone episode. I blame myself. I was rooting for Hussein to beat Hillary because I wrongly believed a candidate with Marxist Muslim roots would have no chance in the general election. WOW was I wrong. Now I wish we had president elect Hillary instead of Hussein. To say I have low expectations from a Hussein presidency is an understatement. And to everyone who takes offense that I call our president elect Hussein I say you should have been more civil to W.
You're right Right Guy. Obama will try to crush his opposition (fairness doctrine etc), so the sooner the ggod guys can mobilise the better. Hi reid. gutting eh. Who would have believed that someone with Obama's handicaps could have pulled it off. The MSM could have destroyed Obama in an instant if they wished. Guilty as hell they are. Whine whine whine. The right deserve everything they get. Too tolerant of the deceit of the left. Too nice to the left. Too fair to the left. This is what you get for it. Feels good does it? Pffft, you just do not know what level of evil you are fighting. Electing compromisers like Bush and then running dickwads like McLame. There's only one thing that will beat the left and that is being smarter than them. Meaning we set the agenda not them. Meaning we make them do all the complaining, not us. Fear is the only thing those leftist scum understand. Lets make them afraid. Conservatives need to a line themselves, organize and fund the most intense defense against what I call the "all out assault on our rights and freedoms" in US history. "We the People" will need to stand up and fight like never before. You cannot count on the Republican Party that has been dismantled right before our eyes in the past two elections. Bush has done his best to see the conservative movement crippled by failed policies. This will take a grassroots effort never seen before, voicing our opinions, and protesting at every step Obama makes to socialize and compromise our rights and freedoms. I sense an overabundance of tin-foil hats here. This is, perhaps, some of the most ridiculous clap-trap I've ever read. Oh, and for those of you who keep spouting nonsense about any possible future imposition of the Fairness Doctrine being an abridgment of free speech, you might want to research how the doctrine is applied. For the children, please, educate yourselves. I love to read stuff like this. It justifies my beliefs. "I wrongly believed a candidate with Marxist Muslim roots would have no chance in the general election"
So, you say you love America? the land of political and religious freedom?
" Too tolerant of the deceit of the left...There's only one thing that will beat the left and that is being smarter than them. Meaning we set the agenda not them. Lets make them afraid." The deceit of the left? all the politicians lie... at least you're acknowledging we're more intelligent. hah. Your leaders have been setting the agenda for quite some time now.. and it's resulting in failure after failure and so much egg on our nation's face it's ridiculous. We will never fear you. We know ours is the just and righteous path. Only a sheep would flock to a speech given by a politician in front of a banner saying "country first" while flying the flag of a party which endorses outsourcing. "all out assault on our rights and freedoms"
That has already been initiated with the patriot act, a plan proposed by who? your leaders. voted for by all, ignorantly, but the origin remains. As all are involved in creating the festering sore on our face which is 911 and the war on "terror," one can only conclude that all are equally at fault in failing the citizens who died that day and their families. If you believe the "official" story, you are lost. The proof is right in front of your face, and you ignore it. Until we come together in the name of the people we will remain slaves to the government. Your notions of communism are convoluded. I love reading those extremist comments. The sides are so far apart that the arguments start to get laughable. Far Left To Fight "Right"
A Message to National Voters.